No! 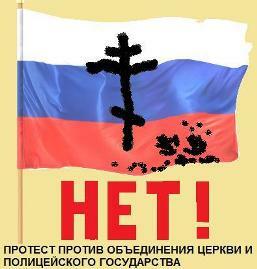 It is a protest against the alliance of church and police state. Constitution of the Russian Federation. Item 14. 1. Russian Federation is a secular state. No religion may be established as a state or mandatory. 2. Religious associations are separated from the state and equal before the law. 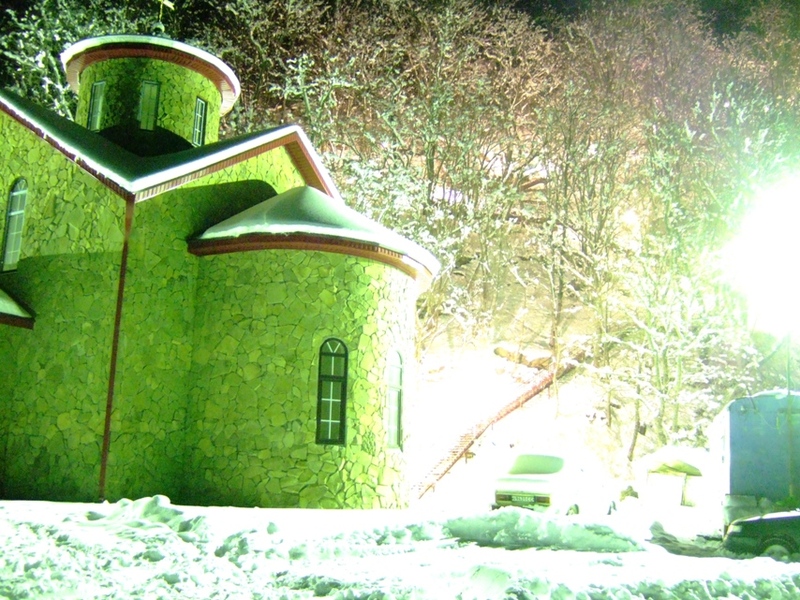 In the gorge Arkhyz Karachai-Cherkessia, near the village of astronomers Lower Arkhyz near the face of Christ, an Orthodox church is built, which illuminated at night. 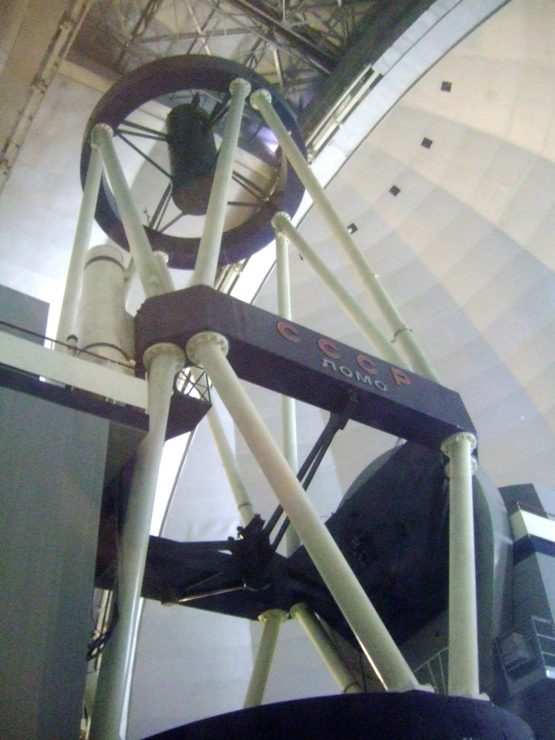 The light source (lamp) is directed to the sky and to the 6-m telescope of the Special Astrophysical Observatory and makes a significant contribution to the light pollution of the sky, creating additional obstacles for the observations. 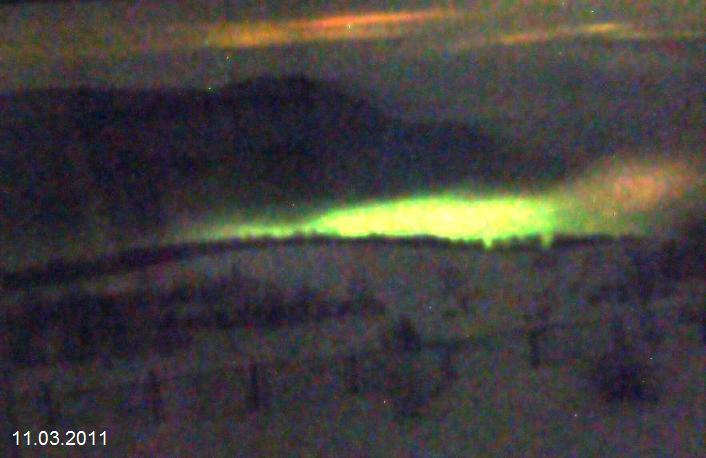 This source is just 4 miles from the center of a 30-kilometer light-protected zone imposed by the Government of the USSR at the opening of the observatory. Under the rules of the light-protected areas, it is unacceptable to use lighting fixtures that allow light leakage above horizon. With sadness I report that, due to careless arrangement of street coverage in large cities and small towns people can no longer admire the divine beauty of the night sky. Such island, where you can see this beauty, is still in Arkhyz Gorge. For astronomers, the dark night sky is a huge scientific and cultural value as a source of knowledge of the world, and creativity. With the Russian 6-m telescope, we are working on forefront of science, able to observe the world class, and hope for the distant future. Unfortunately, the garbage illumination of the sky and careless undermining our hopes. I ask you in setting up a new night lighting of the temple and its neighborhoods to think and to develop a lighting so as not to kill the divine beauty of the sky and not to create interference the astronomers. Categorically unacceptable light the church from the bottom up, the use of gas-discharge lamps bare or floodlights, the light that goes up into the sky. 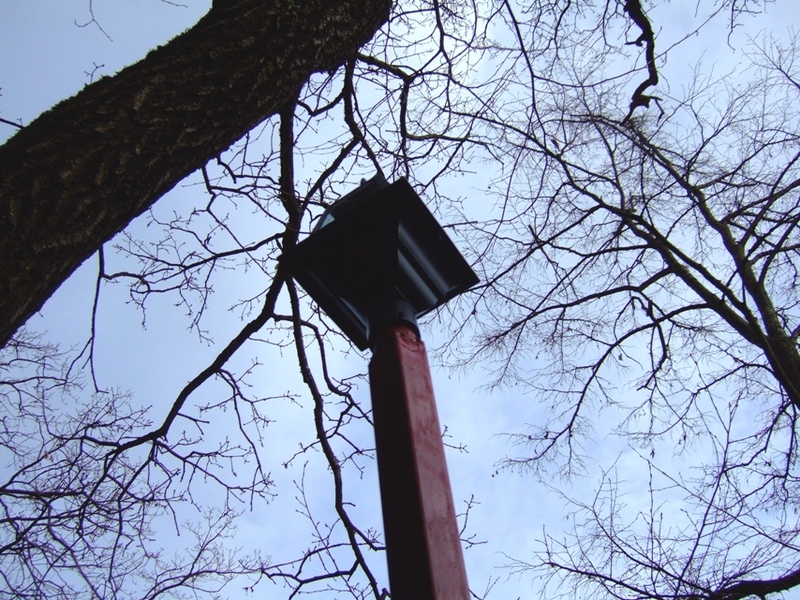 I want to draw your attention that street-coverage devices applicable to light-protected areas are currently not produced in Russia, such devices must be chosen carefully, or even a specially designed, and also should be properly installed. At the time, Patriarch of the Russian Ortodox Church Alexey-II, referring to the scientists, calling them return to the bosom of the church. I believe that this is not possible without the detriment of science, because the mentality of the believer is not compatible with professional scientist whose base is questioning and testing any scientific statements. Undoubtedly, without verification can not be development and refinement of scientific knowledge. However, I believe that scientists and believers should mutually respect and preserve the value of each other. 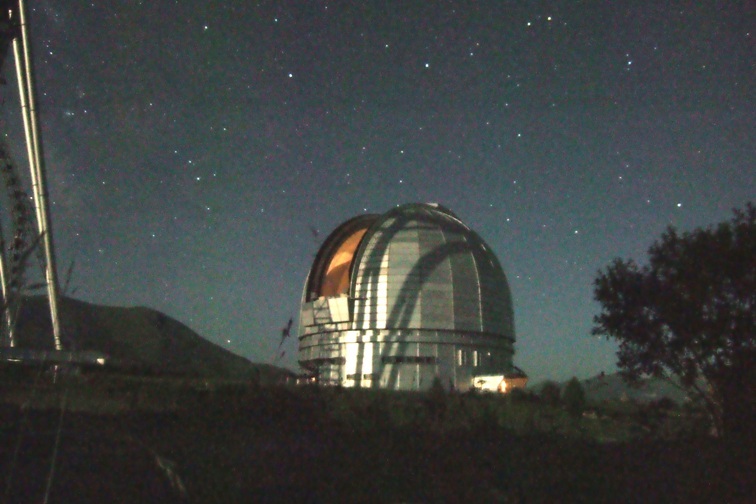 Astronomers, who live and work here for over 40 years, saved and abuse of ancient temples and the face of Christ. Church which in Russia is rapidly expanding its influence, should also respect and carefully kept other values that are important even scientists or atheists. Below I have attached the Resolution of the International Astronomical Union , which reflects the will and aspirations of all the astronomers of the world, professionals and amateurs. 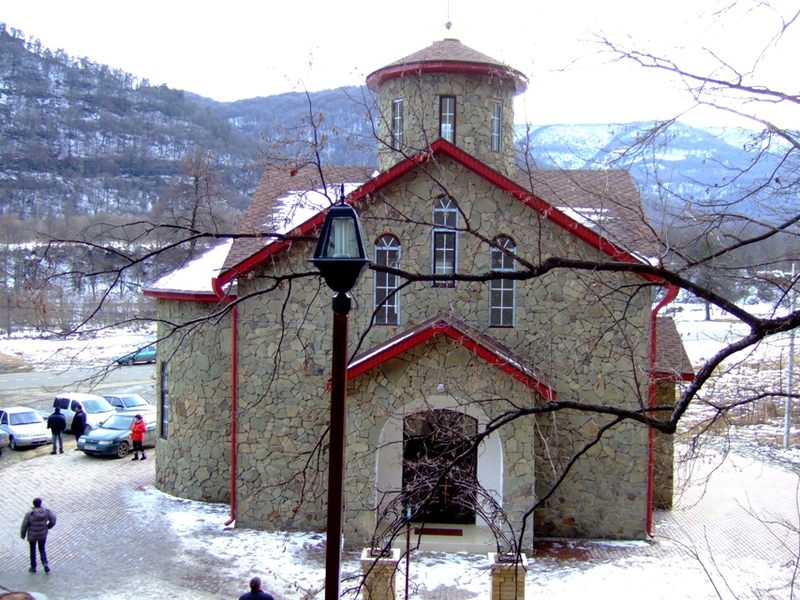 I hope that the Ortodox Church will work with all that preserve the beauty of local nature, and its special piece - the dark starry sky in the mountains. 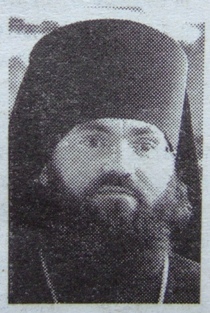 Fiofilakt, the Bishop of Pjatigorsk and Cherkessk (photo by Russian Newspaper No.87, p.14, 2012). To the senior researcher of the Galaxy and variable stars department of the Sternberg Astronomical Institute, Physics and Mathematics doctor candidat Goranskij, V.P. Thank you for your suggestions for a lighting device in the Christ the Savior Cathedral in Lower Arkhyz, whose construction is in present. You referred to a light source (lamp) which is used temporarily for security purposes during the construction period - at the end of the work will be dismantled. 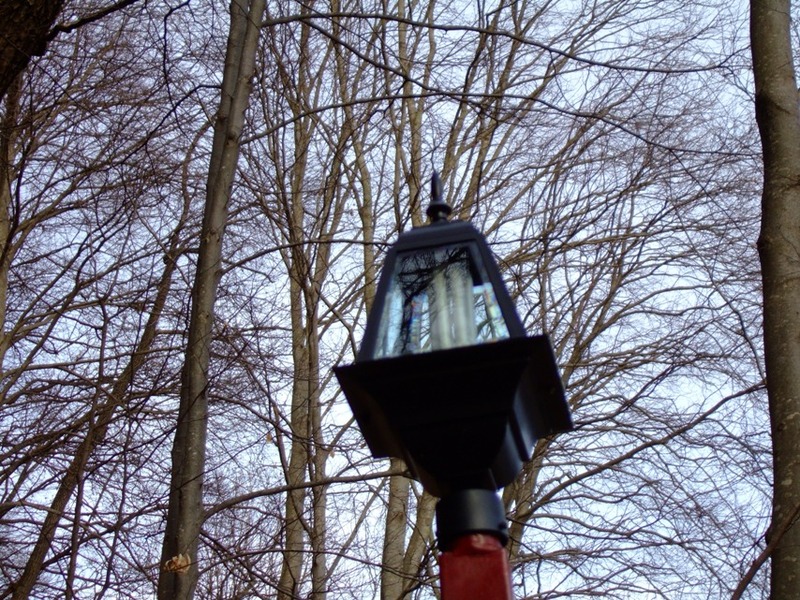 In installing fixed lighting systems, we must take into account your recommendations. In your letter, you also touch on several topics which are not relevant to overcome the effects of light pollution. For example, you point to the fact that astronomers have not desecrated the ancient temples and the face of Christ, but, in fact, abuse of temples never had been one of the merits of men of science, is not it? And it is quite surprising to read in a letter to the scientist claim that mindset of the believer is not compatible with the professional scientist, then as the history evidence to the contrary. Newton, Copernicus, many other outstanding scientists their faith does not prevent the progress achieved in science. However, I think that our ideological differences do not prevent cooperation in solving specific problems. 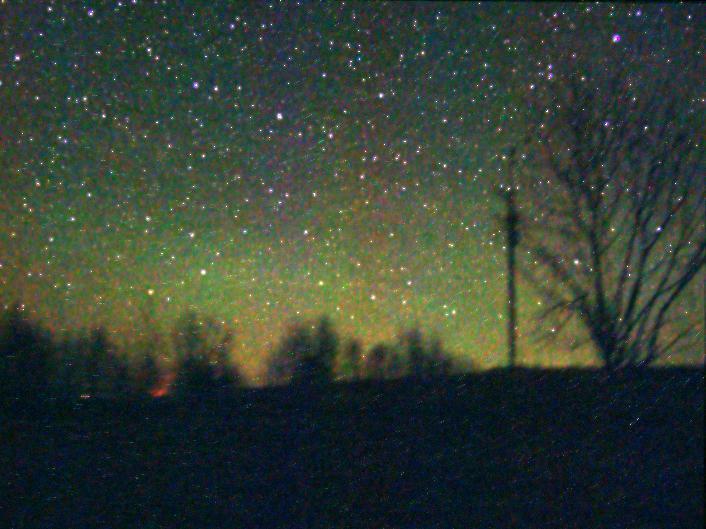 Astronomers have put before the fact, and permanently installed lights shine to this day. On the night of 29 on July 30, 2012 is defective lighting of Christ Savior and the stairs to the Face of Christ has been disabled. 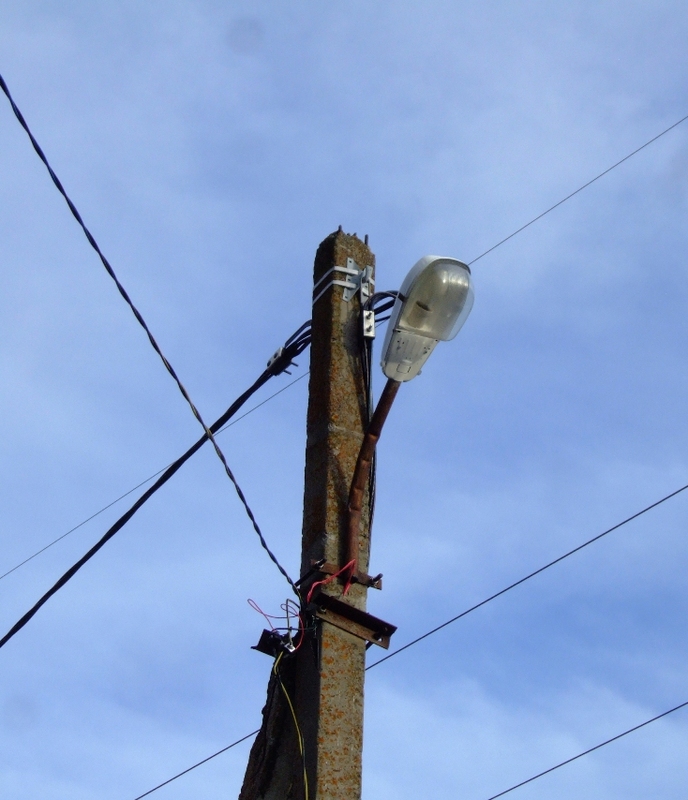 Since 25 September, 2012 this system is enabled again, it turned out not to be dismantled or repaired. 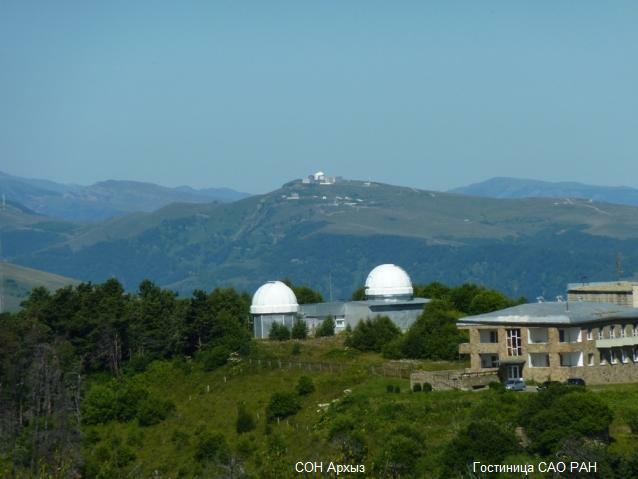 In the security light-protected zone of BTA also has several observatories are located: The optical observation station "Arkhyz" (civilian satellite station), an observation base of Kazan State University, an amateur observatory "Astrotel" and the new military observatory Chapaly. Summer and winter at the observation site. 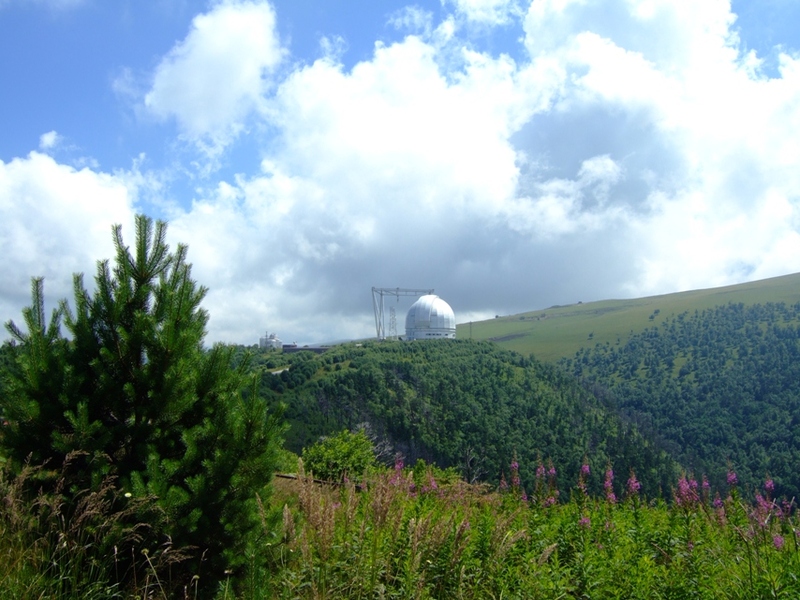 For the BTA dome, the top of the mountain Pastukhov is visible. The tower Zeiss-1000 telescope. 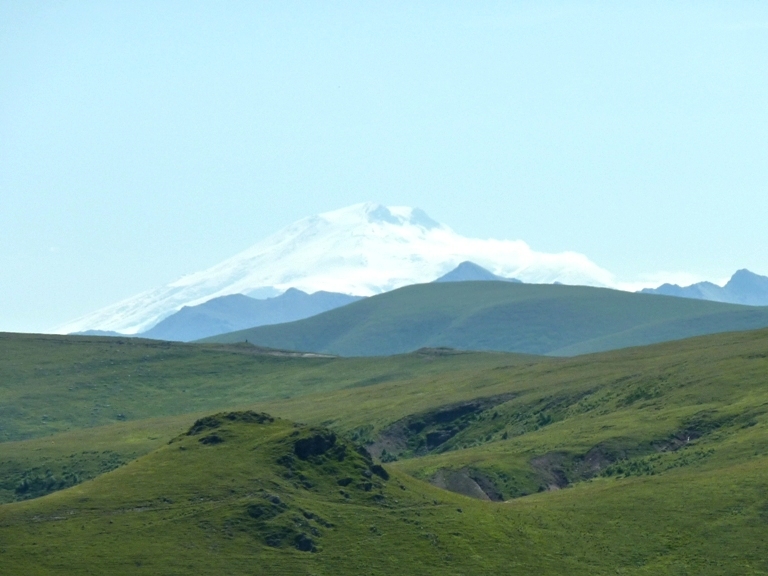 Mount Elbrus view from Mount Pastukhov. 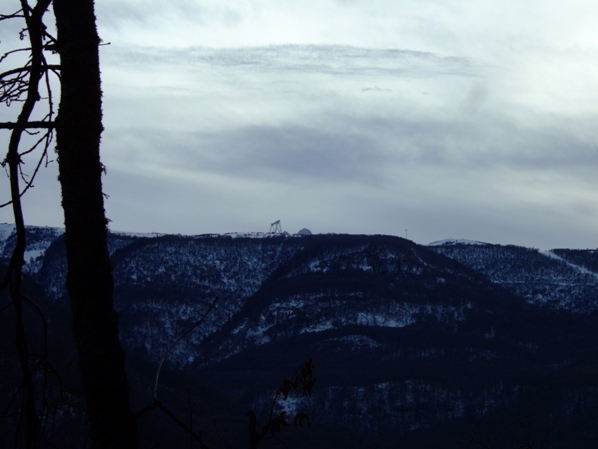 The vertices of the Main Caucasian Ridge are seen through the haze. 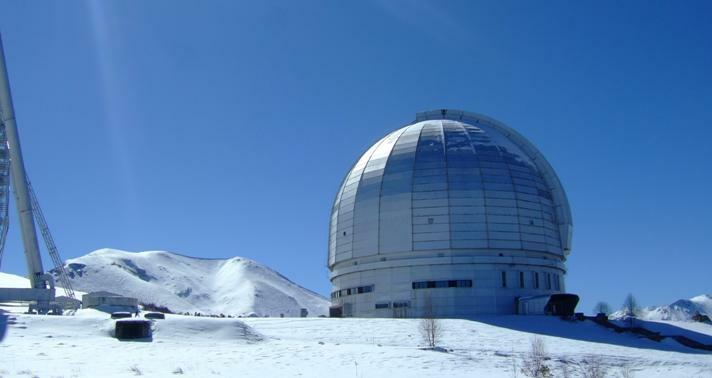 The station of optical observations "Arkhyz." 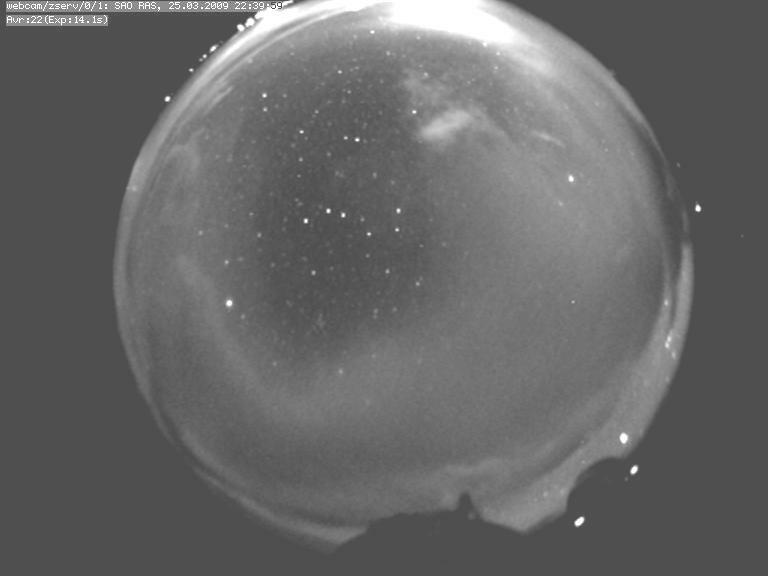 Chapaly Observatory, 18 km from the BTA. 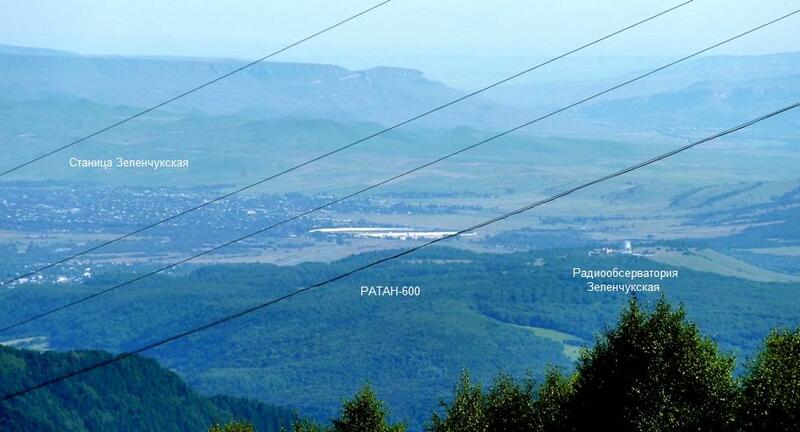 RATAN-600 and 32-meter reflector of Zelenchukskaya Radio Observatory. 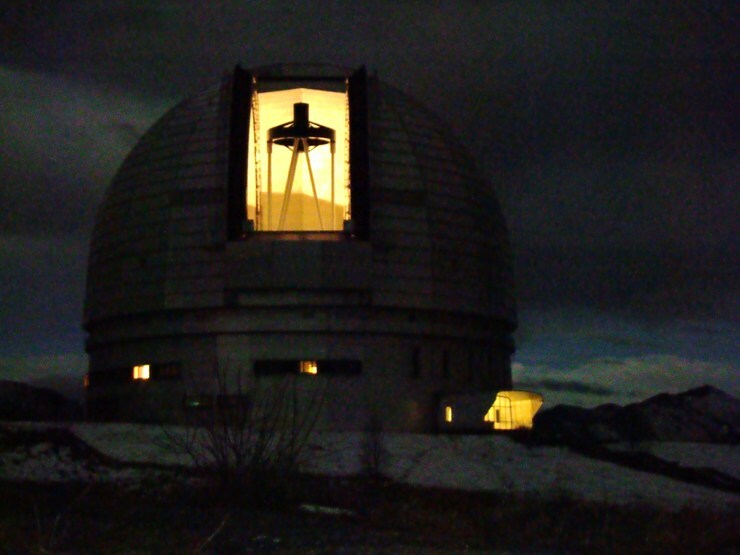 BTA is a giant telescope, the size of a 9-storey building. 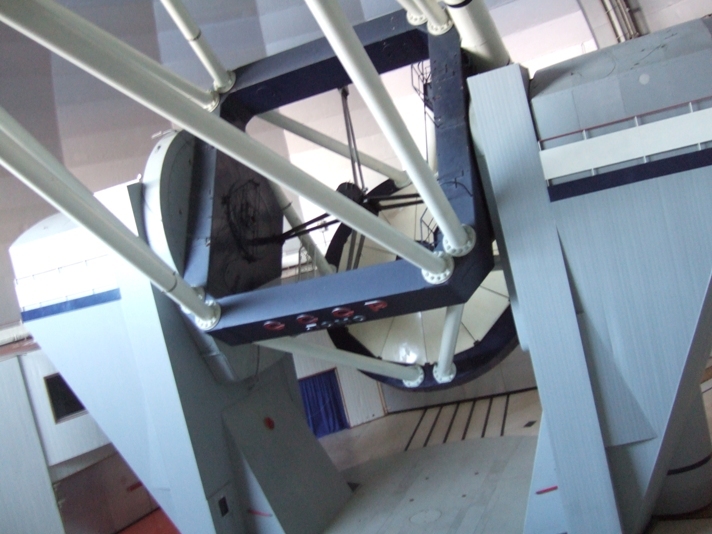 To track the diurnal motion of the stars, the telescope is driven by motors, and its individual parts move with an accuracy of a few microns, and this motion is uneven! 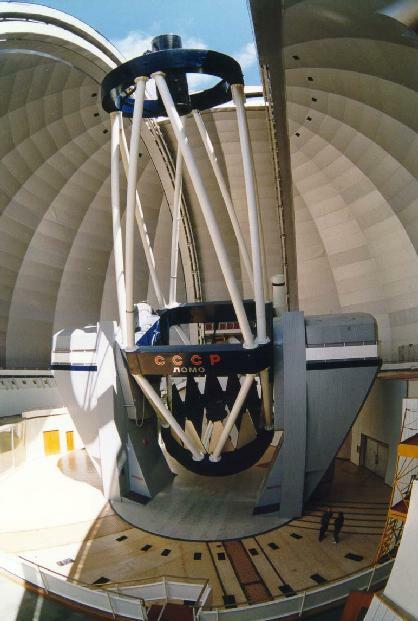 Here one can see a film at YouTube on the functioning the Russian 6-meter BTA telescope. 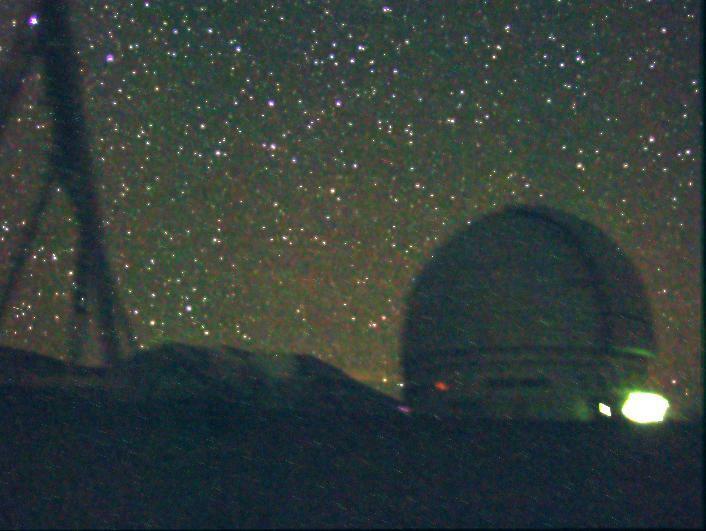 The SAO upper scientific area at night. 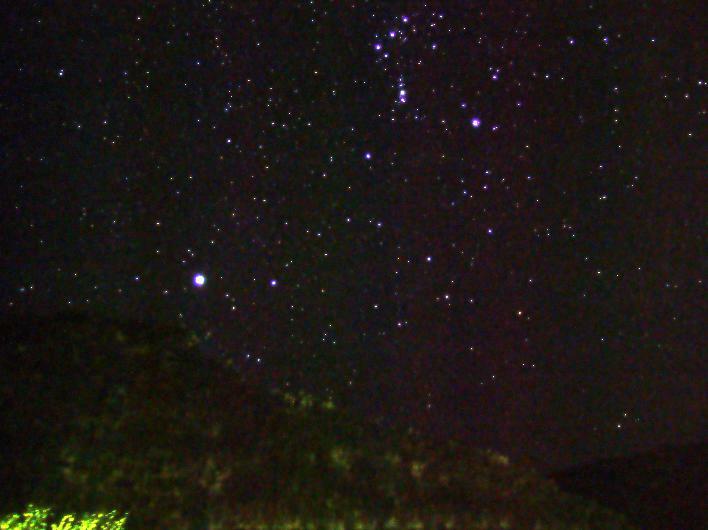 Pictures of the night sky at the SAO upper area. 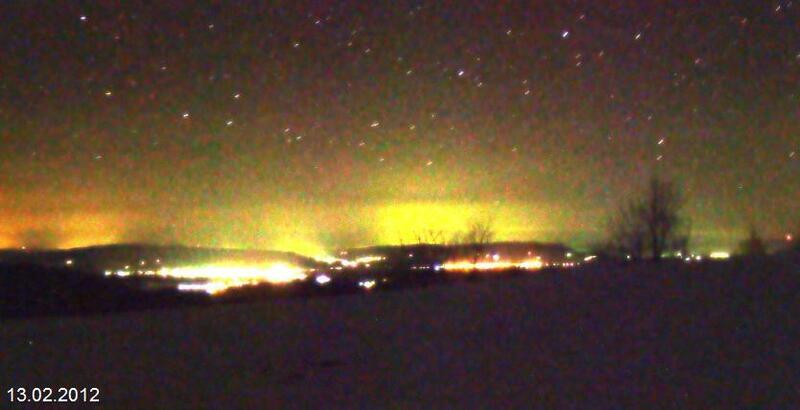 The glow of artificial origin can be seen to the north. 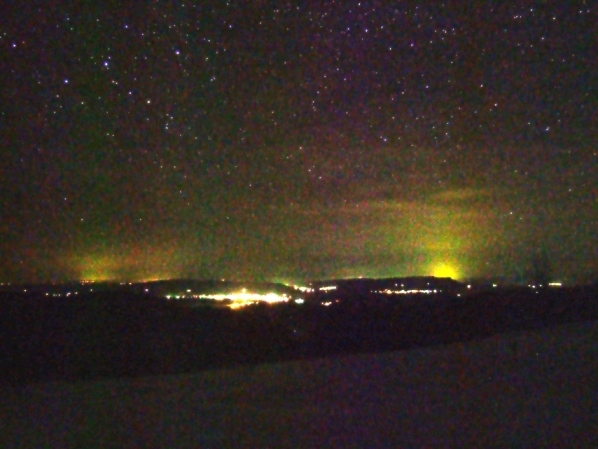 Sources of light pollution at the SAO upper scientific area. 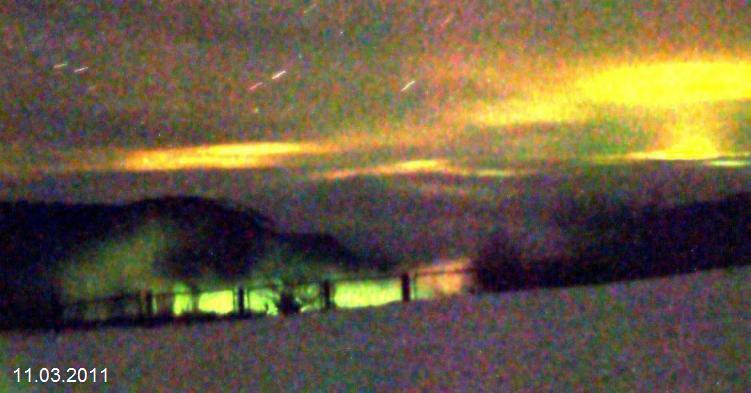 The first 3 pictures show light pollution from the astronomer's village of Lower Arkhyz on the top edge of the low clouds that fill the valley. 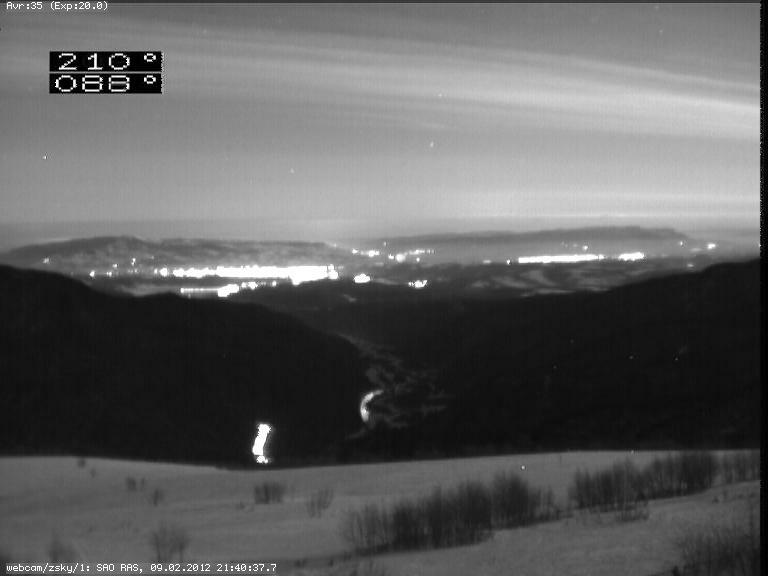 Then, the light contamination of high clouds and the glow in the clear sky in the north. At the last picture at the bottom of the frame, the close and a powerful source, the Cathedral of Christ the Savior is seen. Camera shots of the sky. Now, clouds at the zenith are brighter than sky background. 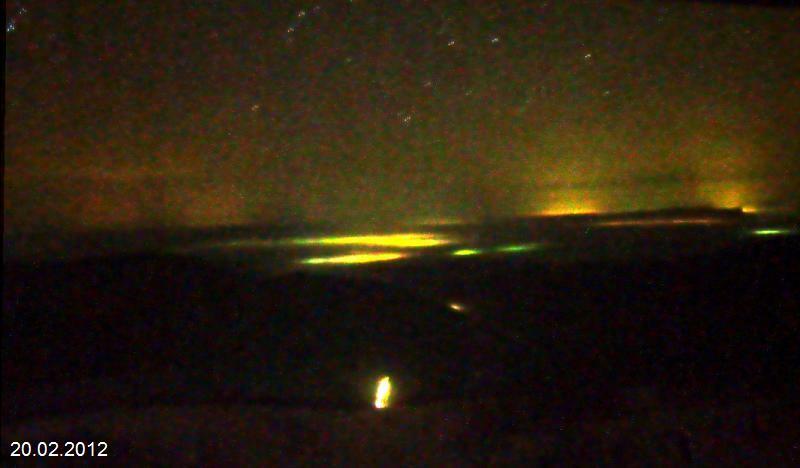 Night lighting of the new Cathedral of Christ the Savior in Lower Arkhyz in the center of the light-protected zone of the Russian 6-meter telescope. It began with the December 2011. 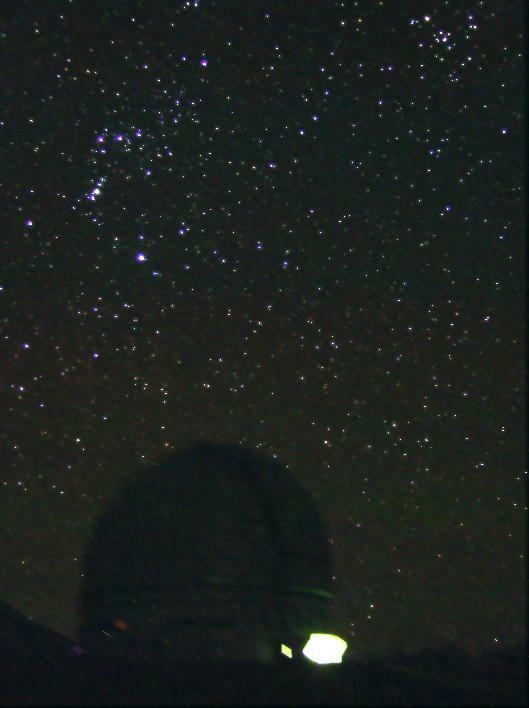 "The night sky has been and continues to be an inspiration of humankind, and that its contemplation represents an essential element in the development of scientific thought in all civilisations..." (from the Resolution B5 of International Astronomical Union General Assembly "In Defence of the night sky and the right to starlight"). The area within a radius of 35 km around the SAO BTA telescope has status of the security zone, confirmed by Decree of the CPSU Central Committee and USSR Council of Ministers No.342-140 of 25.03.1960, the order of the USSR Council of 15.04.1963 No.783-rs Decisions of the Executive Committee of the Stavropol Regional Council of People's Deputies from 27.08.1980 No.738, and Karachai-Cherkessian Executive Committee of the 05.24.1976 No.274r. The new Cathedral of Christ the Savior. The Face of Christ. Aspiring to God. It turns out that the image is not of human hands. This light is shining directly on the BTA. BTA is on the line of sight. 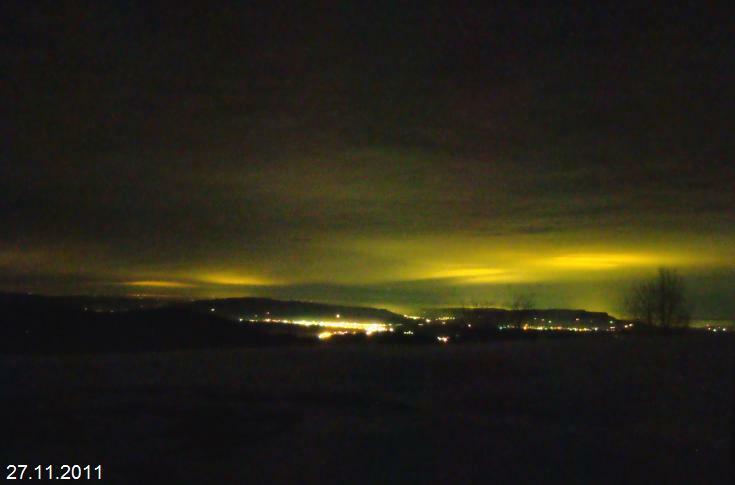 This type of light shines only in the sky. Flashlight does not shine on the stairs by which men ascend to the Face of Christ. Such lamps set 26. 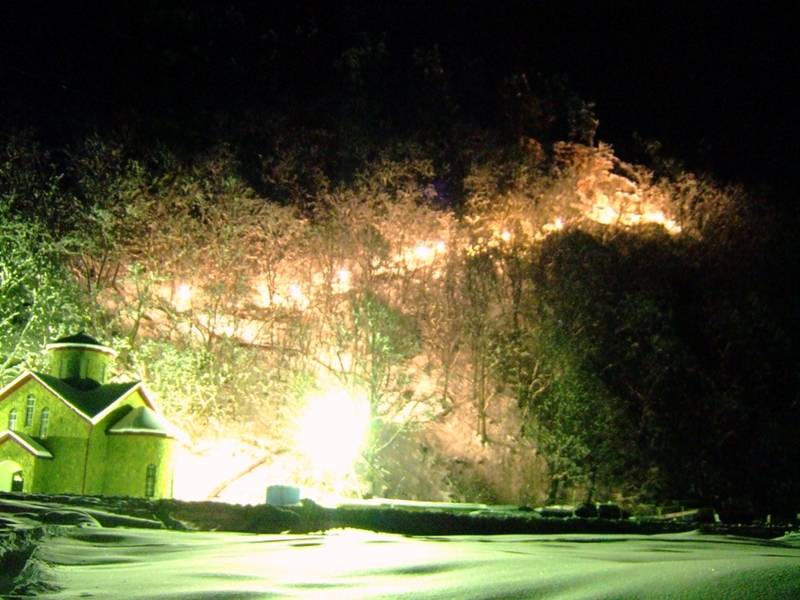 View of lighted stairs at night from the village of Lower Arkhyz. Temple at night. 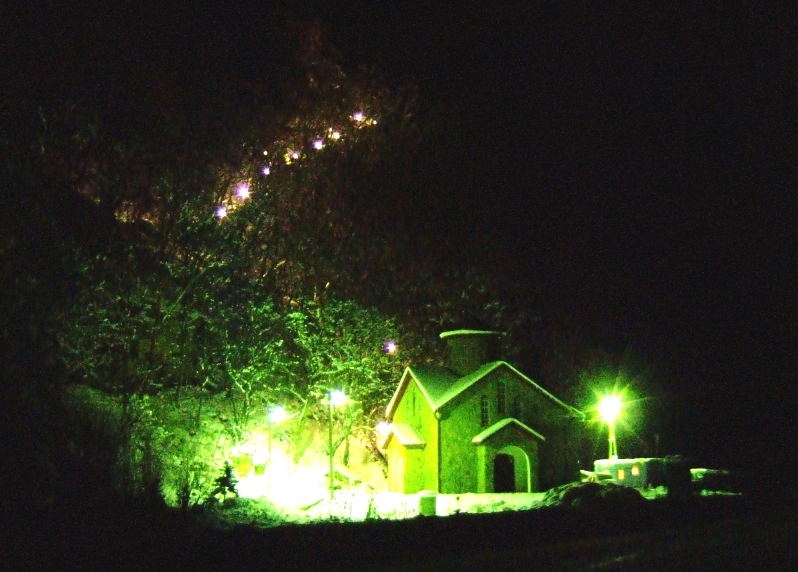 Night view of the church and stairs to the Face of Christ from the observatory. View of the temple and stairs at night. 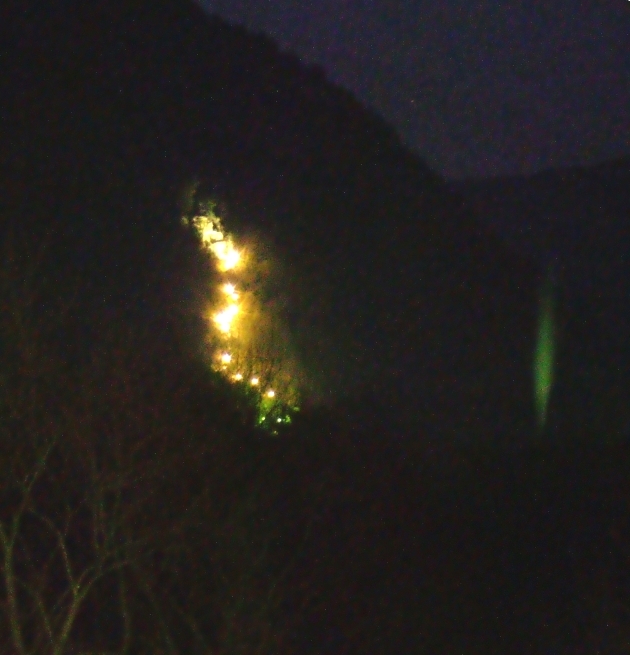 The light from the temple and stairs illuminates hills on the opposite side of gorge. View of the church from the camera view at night. Nighttime photos of the SAO upper area. 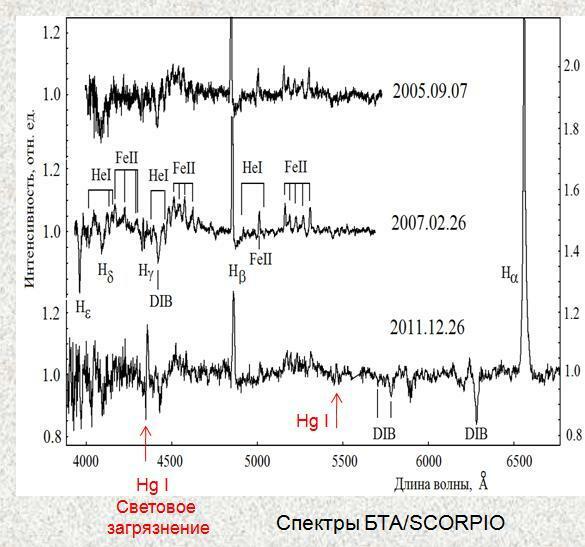 The spectra of the X-ray source Cepheus X-4. Defects in the spectrum of the star caused by light pollution. 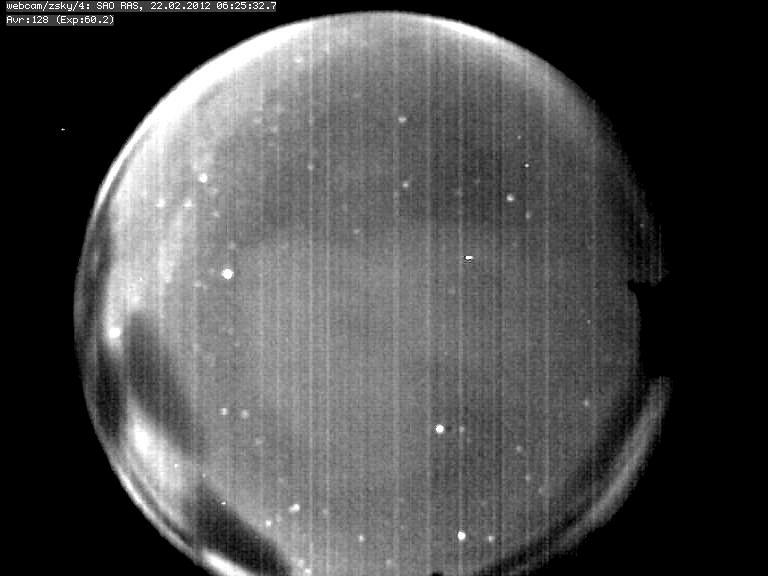 Defects made by the mercury line Hg I in the spectrum after subtraction of the sky. 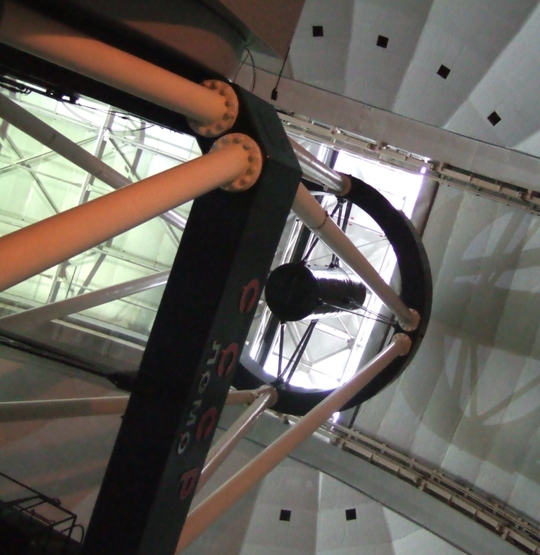 On the tour under the dome of the 1-meter Zeiss telescope. Icons sticked on the four cardinal points show that there was a ceremony of room consecration or casting out demons. View of the icon was certified by Patriarch Alexey II, and they are symbols of the Orthodox Church. These are instruments of torture and executions. The man was nailed to the big cross bar, at the bottom of the crossbar was a feet support was fastened obliquely to increase human suffering. 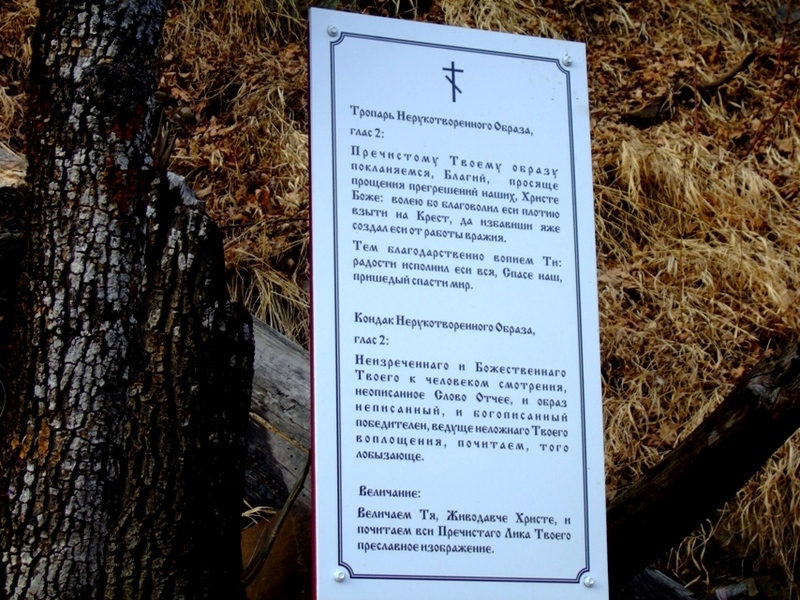 The crossbar at the top was a label that contains written name and the guilt of a man, subjected to torture: IHЦI means Jesus from Nazareth, the King of the Jews. Wines of Jesus was that he represented himself for the King of the Jews. Other inscriptions: Jesus Christ (the Messiah), the king of glory, nick (the winner). The tomb, on which stands a cross, a symbol of Mount Calvary, under which the first man was buried - Adam (skull). To the left of the cross - the spear, which guards pierced the breast of man, to ensure death. The control spear. On the right - a stick, at the end of which the guards filed a rag soaked in vinegar, if a person asked to drink. It was all hung in a place where astronomers work. 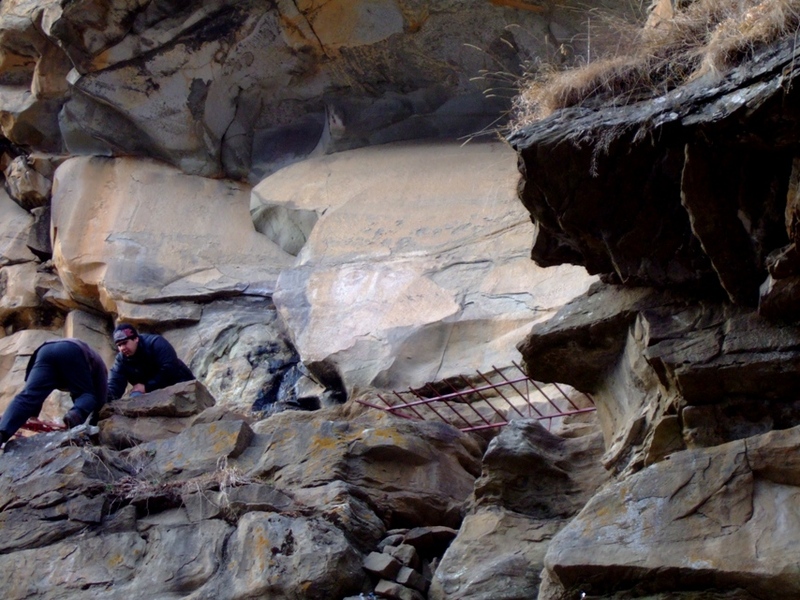 Experience of investigation. I went to the nearest church - the southern Church near Lower Arkhyz to a minister with a photograph of the icon with the question: "Is it your job?". The answer was: "None. Orthodox cross with two crossbars - is our character. 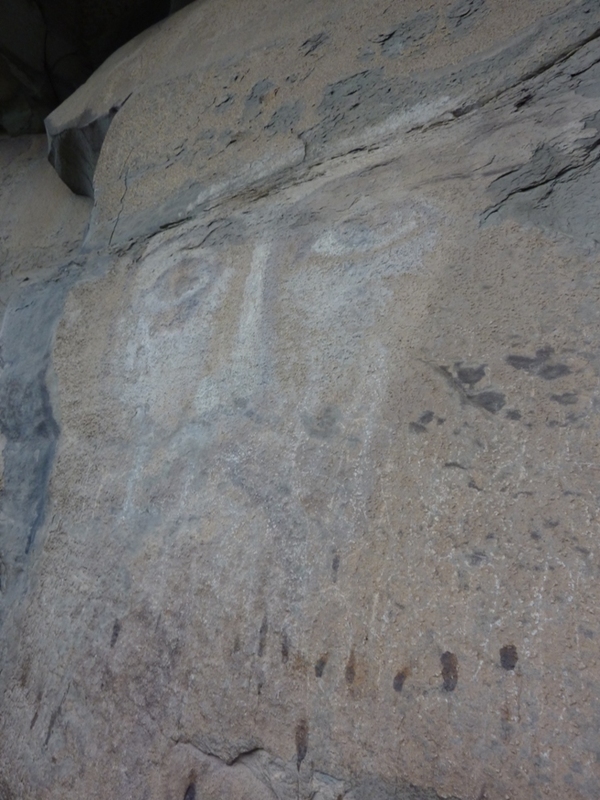 What are the skull and other symbols and letters - we do not know. This was some sect". I tried to find in the Internet the sect with such symbols. 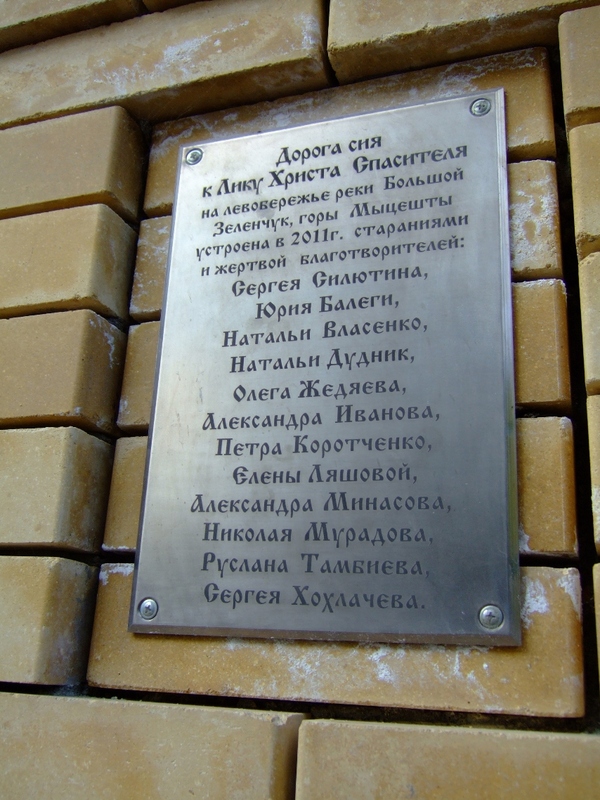 But accidentally found a Patriarch Alexey signed certificate issued for the manufacturer of the glued icon on the fact that all these signs are symbols of the Russian Ortodox Church, and their detailed explanation. 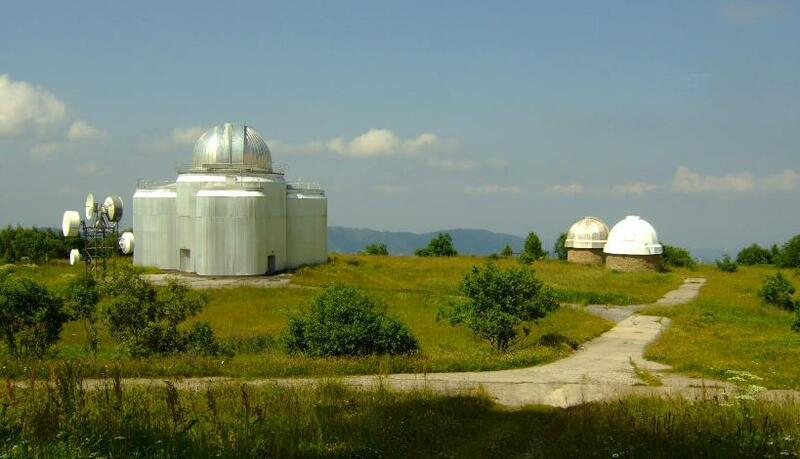 The administration of the observatory was at the silent query. 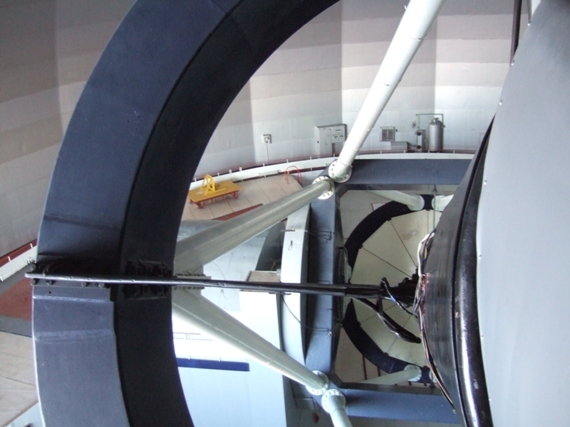 Responsible for the telescope says: "What's wrong with that?" 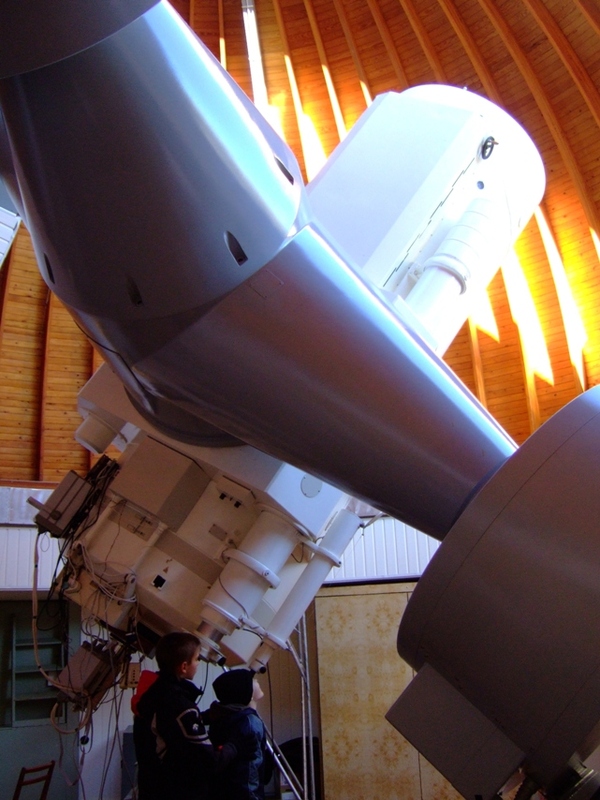 Actions of Russian Ortodox Church against astrophysics were carried with financial support and competence of Director of the Special Astrophysical Observatory, corresponding member of RAS Y. Balega! Documentary evidence is a memorial plaque on the gate to the stairs, his name is the second in the list.